This 17th-century table cabinet recently went under the hammer at Bonhams' 'Europe - Defining Style' auction, which featured fine European furniture, works of art, sculpture and silver and gold boxes. The Augsburg table cabinet has a triumphal-arch facade and features ripple-moulded ebony (Diospyros spp. ), white metal and scarlet tortoiseshell. The mounts are in the manner of German goldsmith, Wenzel Jamnitzer. The facade is surmounted by a broken arch architectural pediment, on which are seated figures representing Night and Day, flanked by putti depicting The Four Seasons. There are four short drawers to each side and one long drawer applied with chased mounts and flanked by Corinthian columns. Its mirrored tabernacle compartment reveals a triumphal arched niche with a bas-relief of the Triumph of Venus derived from the Judgement of Paris, while the fretted medallion bas-relief of the base appears to depict a scene from the Trojan wars. The triumph of Ceres, goddess of Agriculture, with the laying aside of arms, is celebrated in one of the other drawer medallions. The pierced three-quarter balustraded gallery with cast urn and foliate finials is above a sliding rectangular sprung top, which encloses a secret compartment, above a central recessed mirrored niche with turned pilasters and a central cast mount of Venus and Cupid on a chequered ebony and ivory floor. The cabinet rests on ball feet and measures 60cm wide, 27cm deep and 62cm high. 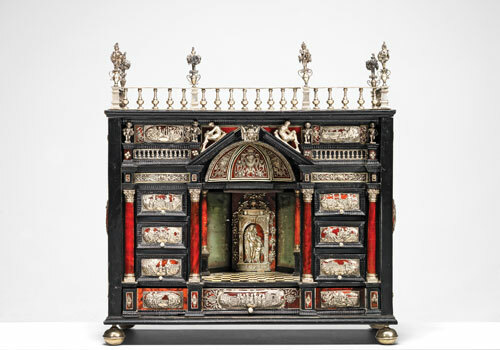 A comparable cabinet previously in the possession of Archduke Ferdinand II (1529-1595) in ebony and silver is now in the collection of the Kunsthistorisches Museum in Vienna. Wenzel Jamnitzer (1507/8-85) was one of the most well known and accomplished goldsmiths in 16th-century Europe. His Nuremburg workshop produced numerous objects including silver caskets and mounts. He was employed as a court goldsmith to several Holy Roman Emperors, including Charles V, Ferdinand I, Maximilian II and Rudolf II. He made Renaissance-style vases and jewellery boxes from precious metals, which incorporated gemstones, shells, coral and even small birds' eggs. He was also an artist, printmaker, inventor and coin cutter. Many of his works were melted down during the Thirty Years' War but surviving examples can be seen at the Louvre and the Victoria and Albert Museum.